MorphVOX will customize your voice online and in-game. Take your voice changing to a new whole new level with superior voice learning technology, background cancellation, and sound quality. 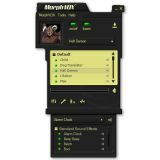 You can download free voice or sound packs that will add many new voices and sounds to MorphVOX. Tweak every of these voices to your heart's content to create even more voice combinations. Try out the Backgrounds option which allows you to add any background sound while you talk. Trick your online partners: sound like you are in on the street or at shopping. Beautiful voice changing algorithms and very quiet background cancellation make it one of the cleanest sounding voice changers on the market. Its high quality sound is great for making voice overs for your newest video or audio project. Enhanced for online games. Use it for adjust your voice to role-play and add fun to online games. - Fresh professional interface using standard windows controls. - Backup and Restore all your settings to a single file. - Better list administration for all your voices and sound effects. - Multiple-user support, simply switch among distinct speakers. Change your voice to enhance your online gaming. Disguise your voice to trick your friends. MorphVOX Classic Voice Changer has been tested by Download82.com team against viruses, spyware, adware, trojan, backdoors and was found to be 100% clean. Our editors will recheck this software periodically to assure that it remains clean.